China’s colossal growth in aluminium production has changed the market dynamics for aluminium in recent years. The impact of this growth was initially faced by primary smelters in U.S. Slowly; Chinese imports are taking over a large share in the U.S. aluminium foil industry that supplies foil wraps for potato chips, pill packages yogurt, candies etc. A plant at Winston-Salem, N.C. that manufactured ultrathin foil for wrapping of Camel cigarettes sold the facility as a part of a strategy to buy more of its foil from China. Camel’s original foil supplier, Alpha Aluminum Inc. started by diversifying into making heavier aluminium products to survive the bearish market. But finally, in July, it closed the plant which has cut jobs of 100 employees working out there. After they closed down there is only one U.S. company manufacturing these light-gauge foil used to wrap items in food, pharmaceuticals and other consumer products. The U.S. has a big market for aluminium foils as flexible packaging is one of the most profitable industries in the nation. According to the Aluminum Association, the aluminium foil market is worth about $5 billion, and about 36% of it is supplied by imports, up from only 16% in 2007. As an interesting observation, net U.S. exports of aluminium sheets, plates, and foil displayed a generally upward trend from 2007 to 2013. However, over the last two years, this growth was followed by a fall almost three times larger in value, resulting into a significant trade surplus of 511 million USD in 2015. Aluminium majors like Alcoa and Novelis have already backed out from the commodity foil business and they are concentrating on cans leveraging on recycling potential. 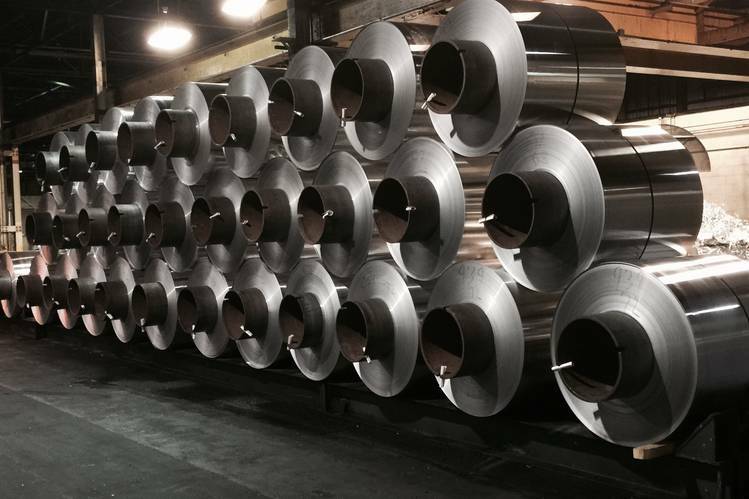 After Alpha’s closure, Goose Creek, S.C.-based JW Aluminum Co. remains to be the only domestic producer who specializes in light gauge foil. There are still a few kitchen foil makers like Reynolds Consumer Products, which holds a decent market shares in high-end segment of the U.S. Aluminium Foil Industry. However, it is apparent that most of the kitchen foils distributed in U.S. groceries is made from imported foil from China. Since U.S. has a big market for thin foils and the order comes in bulk from big companies, foil manufacturing has become a lucrative business for Chinese companies. A combination of government subsidy and a growth of consumer culture has boosted Chinese foil capacity to 3.7 million tons a year from 250,000 tons in 2004, and foil consumption to 2.4 million tons in 2014 from 594,000 tons in 2005, according to U.K.-based market researcher CRU Group. It is also claimed that foil exporters from China enjoys 15% value-added tax rebate from the Government. In the first seven months of 2016 china exported a total of 623,741 tons of aluminium foils globally. (SMM data). According to analysts the flexible packaging foil which is mostly used to wrap food item is the mostly affected in the U.S. foil market. Robert Gamba, who recently stepped down from his position as Alpha’s chief executive, said that the plant was affected by import which was 20% cheaper than his products. “Buyers are always bringing up the prices they can get in China,” he said. “The foil market in this country is basically destroyed…If you’re just trying to sell material to hold on, you’re selling [foil] below cost,” Gamba added. “A couple of years ago, I started buying much more from China, because it was cheap and usually pretty good quality,” says Howard Lent. The company now imports 90 per cent of its aluminium rolls from abroad and 20 per cent of it comes from China. Mr. Lent says he’d prefer to buy from America, but domestic suppliers can’t always give him the required specifications. “In China, when I ask for something, the answer is always ‘yes’,” he said.